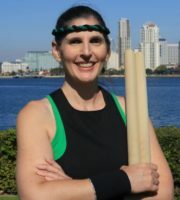 Liz began her taiko journey after seeing Naruwan perform at a festival in 2015. Following that performance, she signed up for what she thought would be a one-time workshop experience and ended up finding a lifelong passion and a second family. She is grateful to have been welcomed into this amazing group and to continue to receive their support and encouragement every day.